On August 10, 2018, a Horizon Air Bombardier Dash 8 Q400 was stolen from Seattle–Tacoma International Airport (Sea–Tac) in SeaTac, Washington. The perpetrator, 29-year-old Richard Russell, was a Horizon Air ground service agent with no piloting experience. He performed an unauthorized takeoff and two McDonnell Douglas F-15 Eagle fighters were subsequently scrambled to intercept the aircraft. Sea–Tac air traffic control made radio contact with Russell, the sole occupant, who described himself as a "broken guy, got a few screws loose I guess." Approximately one hour and 15 minutes after takeoff, Russell committed suicide by intentionally crashing the aircraft on the lightly-populated Ketron Island in Puget Sound. The incident aircraft was a Bombardier Dash 8 Q400, owned by Horizon Air (and operating for Alaska Airlines) with the registration N449QX and serial number 4410. It had first flown in 2012 and was delivered new to Horizon Air in the same year. The same aircraft landed at Seattle–Tacoma International Airport at 13:35 local time the afternoon of the incident, after an in-service flight from Victoria, British Columbia. It was not scheduled to fly again that day. Chart of the far northern end of Seattle–Tacoma International, showing the location of Cargo 1 and runway 16C. 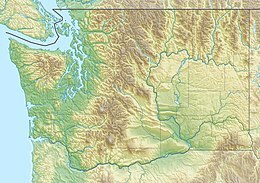 Location of Seattle–Tacoma International Airport and Ketron Island (not depicted on map) within Washington state. The aircraft was stolen from Plane Cargo 1 at the north end of Sea–Tac airport and maneuvered to runway 16C via taxiways. Seattle Tower tried several times to get the aircraft to identify itself on frequency; there was no response. A nearby Alaska Airlines jet on the ground reported that the aircraft had begun a takeoff roll with its wheels smoking, and an unauthorized take-off was made at 19:32 local time (02:32 UTC, August 11). In response, two McDonnell Douglas F-15C Eagles of the Oregon Air National Guard's 142nd Fighter Wing under the command of NORAD were scrambled at around 20:15 local time from Portland Air National Guard Base to intercept it, both armed with AIM-9 Sidewinder and AIM-120 AMRAAM air-to-air missiles and going supersonic, generating sonic booms on the way to the Puget Sound area. A KC-135R Stratotanker refueling tanker was also scrambled from Fairchild Air Force Base to support the F-15 flight. Flights in and out of the airport were temporarily suspended. Seattle–Tacoma air traffic control (ATC) maintained radio contact with the occupant. The transmissions were on an open frequency and were quickly posted on social media websites. He said he was a "broken guy, got a few screws loose I guess. Never really knew it until now." When ATC suggested that the plane be landed at Joint Base Lewis–McChord, the occupant refused: "Those guys will rough me up if I try and land there. I think I might mess something up there, too. I wouldn't want to do that." He asked ATC if he could get a job as a pilot with Alaska Airlines if he successfully landed the aircraft. ATC said that "they would give you a job doing anything if you could pull this off," to which he replied "Yeah right! Nah, I'm a white guy." He spoke of wanting to do "a couple maneuvers to see what [the aircraft] can do," and requested the coordinates of an orca that had been brought to national attention, saying, "I want to go see that guy." He stated that he did not want to hurt anyone, and in the final minutes of the communication apologized to his friends and family. Near the end of the flight, the aircraft was filmed doing aerobatic maneuvers over Puget Sound, footage of which appeared on social media. A veteran pilot said the maneuvers "seemed pretty well executed, without either stalling or pulling the wings off." When an air traffic controller requested he land the plane after these maneuvers, he said "I don't know. I don't want to. I was kind of hoping that was gonna be it, you know?" He added that he "wasn't really planning on landing it." The two F-15s attempted to direct the aircraft toward the Pacific Ocean, and did not fire on it. The Q400 ultimately crashed at 20:43 local time on Ketron Island in Puget Sound, Pierce County, Washington, killing the occupant and destroying the aircraft. A tow boat crew was the first to respond. Firefighters from West Pierce Fire and Rescue and other nearby departments arrived on the island approximately 1.5 hours after the crash, due to waits for the Steilacoom–Anderson Island ferry, and contending with thick brush when crews arrived on scene. The two-acre fire the crash caused was suppressed by a lack of wind and dry brush, and was extinguished by the following morning. The Pierce County Sheriff's Office both thanked the public for its accurate information, and acknowledged on August 11 that federal agencies would be leading the investigation, primarily the Seattle office of the Federal Bureau of Investigation (FBI). It described the perpetrator, identified as 29-year-old Richard Russell, as suicidal and said his actions did not constitute a "terrorist incident". Alaska Air Group CEO Brad Tilden announced on the same day that the airline was coordinating with the Federal Aviation Administration, the FBI, and the National Transportation Safety Board, and was "working to find out everything we possibly can about what happened". On August 12, the FBI said that it had recovered the flight data recorder along with components of the cockpit voice recorder. The equipment was sent to the National Transportation Safety Board for processing. On November 9, the FBI stated that it had completed its investigation. Terrorism was ruled out and it was found that Russell had acted alone. The final descent at Ketron Island was determined to be intentional, and suicide was listed as the manner of death. The FBI stated, "Interviews with work colleagues, friends, and family—and review of text messages exchanged with Russell during the incident—did not identify any information that would suggest the theft of the aircraft was related to wider criminal activity or terrorist ideology. Although investigators received information regarding Russell’s background, possible stressors, and personal life, no element provided a clear motivation for Russell’s actions." Richard Russell was a Horizon Air ground service agent from Sumner, Washington. He had been part of a tow team, which repositions aircraft on the airport apron, for about four years. An operational supervisor for Horizon Air described Russell as "a quiet guy" who was "well liked by the other workers". The city of SeaTac has a $15-an-hour minimum wage, but this does not apply to airline employees such as Horizon Air ground service agents. During his communication with air traffic control Russell made a complaint about wages, stating: "Minimum wage, we'll chalk it up to that. Maybe that will grease some gears a little bit with the higher-ups." Russell was born in Key West, Florida, and moved to Wasilla, Alaska, at the age of seven. He attended Wasilla High School, where he wrestled and competed in track and field. He was known as "Beebo" to his friends and family. He had been married since 2012; he met his wife in 2011 at a Campus Crusade for Christ meeting at Southwestern Oregon Community College. Together they started a bakery in North Bend, Oregon. They sold the bakery in 2015 so his wife could be closer to her family; they settled in Sumner, Washington, and Russell found employment with Horizon Air. He was an avid traveler and attended Washington State University Global Campus, majoring in social science. He had planned to seek a management position at Horizon Air or become a military officer after receiving his degree. He was active in his church and a leader in the local Christian youth ministry Young Life. Horizon Air CEO Gary Beck stated that, as far as the company knew, Russell did not have a pilot's license. Beck said the aerial maneuvers were "incredible" and that he "did not know how [Russell] achieved the experience that he did." During his conversation with air traffic control, Russell said he "[knew] what [he was] doing a little bit" because he had experience playing video games. After the incident, Joel Monteith, a pilot for SkyWest Airlines, relayed to an emergency dispatcher that in 2017 he saw Russell and another man "pointing and flipping switches" in the cockpit of a SkyWest aircraft parked at Sea–Tac airport. Monteith stated the men told him they were training to use the aircraft's auxiliary power unit so they could tow it, but said it was "suspicious" that they left when he confronted them. Monteith also recalled that Russell had been in the cockpit of an Embraer 175 with him, and that Russell asked him about his "flows, which is the preflight preparation I do for takeoff." Russell's family released a statement on August 11, stating they were "stunned and heartbroken" and "devastated by the events". ^ a b c "National Transportation Safety Board Aviation Accident Preliminary Report Accident Number: WPR18FA220" (PDF). National Transportation Safety Board. August 10, 2018. Archived from the original on August 17, 2018. Retrieved August 17, 2018. ^ Dietrich-Williams, Ayn (August 15, 2018). "Update on Investigation into Unauthorized Flight". Federal Bureau of Investigation. Retrieved August 15, 2018. ^ Stewart, Ashley (August 10, 2018). "Alaska Air Horizon plane crashes after being stolen by airline employee". Puget Sound Business Journal. Retrieved August 11, 2018. ^ a b c d "N449QX Criminal Occurrence description". aviation-safety.net. Aviation Safety Network. Retrieved August 11, 2018. ^ a b c d Day, Matt (August 11, 2018). ""We were all screaming, 'Oh my god'": How the Horizon Air theft and crash unfolded". The Seattle Times. Retrieved August 11, 2018. ^ a b c Seattle Times staff, news services (August 10, 2018). "How it unfolded: Full coverage of the Horizon Air crash and the man who stole the plane from Sea-Tac". The Seattle Times. Retrieved August 15, 2018. ^ a b "'Stolen' plane closes Seattle airport before crashing into sea". bbc.co.uk. BBC News Online. Retrieved August 11, 2018. ^ Bethany, Bethany; Marris, Sharon (August 11, 2018). "Stolen plane was chased by military jets before it crashed". news.sky.com. Sky News. Retrieved August 11, 2018. ^ a b Hradecky, Simon (August 11, 2018). "Crash: Horizon DH8D at Ketron Island on Aug 10th 2018, stolen aircraft crashed into forest". avherald.com. The Aviation Herald. Retrieved August 11, 2018. ^ "Stolen plane closes Seattle-Tacoma airport before crashing". BBC. August 11, 2018. Retrieved August 11, 2018. ^ Rogoway, Tyler. "Oregon F-15s Scramble To Seattle To Intercept Possibly Stolen Q400 Airliner (Updated)". The Drive. Retrieved August 15, 2018. ^ a b Demerly, Tom (August 11, 2018). "F-15Cs Intercept Stolen DASH-8 Airliner out of Seattle Tacoma Airport Before Crash". The Aviationist. Retrieved August 11, 2018. ^ "LIVE: Plane stolen from Sea-Tac Airport crashes on small island; no passengers on board". abc10.com. KXTV-TV. August 10, 2018. Retrieved August 10, 2018. ^ Sailor, Craig (August 11, 2018). "Pilot wanted to do aerobatics, apologized for his actions as he spoke with air traffic control". The News Tribune. Retrieved August 11, 2018. ^ a b Copp, Tara (August 11, 2018). "NORAD F-15Cs intercept suicidal pilot in dramatic chase near Seattle". Military Times. Retrieved August 12, 2018. ^ a b Fortin, Jacey (August 11, 2018). "Passenger Plane Stolen by Employee Crashes on Island Near Seattle Airport". The New York Times. Retrieved August 11, 2018. ^ a b Miroff, Nick; Horton, Alex. "Seattle hijacker's plane heist, midair stunts and fiery crash expose gaps in aviation security". The Washington Post Online. The Washington Post. Retrieved August 13, 2018. ^ a b c Jessica McBride. "Richard Russell, 'Rich': 5 Fast Facts You Need to Know". Heavy.com. ^ a b c Cook, Jeffrey (August 11, 2018). "Airline worker who stole plane told air traffic control 'I don't want to hurt no one'". abc13.com. KTRK-TV. Retrieved August 11, 2018. ^ Kheel, Julian (August 11, 2018). "Horizon Air Q400 Aircraft Crashes After Being Stolen From Seattle Airport". The Points Guy. Retrieved August 11, 2018. ^ Clive, Irving (August 12, 2018). "SeaTac Hijacker Had the Skills to Take Out a Skyscraper Horizon Air ground handler Richard Russell knew how to fly without tearing the plane apart—and enough fuel to be a flying bomb. How was he able to take off without being stopped?". Daily Beast. Retrieved August 12, 2018. ^ Sider, Alison; Pasztor, Andy; Greene, Jay (August 12, 2018). "Plane Thief Said He Trained on Games, Didn't Plan to Land". The Wall Street Journal. ^ a b "NORAD: Fighter jets were trying to direct stolen plane over Pacific Ocean when it crashed". The Seattle Times. August 11, 2018. Retrieved August 15, 2018. ^ MyNorthWestStaff (August 11, 2018). "Towboat crew dropped everything to respond to Ketron Island crash". My Northwest. Retrieved August 11, 2018. ^ Misciagna, Vanessa (August 12, 2018). "Firefighters battle more than flames after Ketron Island plane crash". KING-TV. Retrieved August 13, 2018. ^ Pulkkinen, Levi (August 12, 2018). "Seattle plane crash: 'heartbroken' family remember gentle man who meant no harm". The Guardian. Retrieved August 13, 2018. ^ Pierce County Sheriff's Department [@PierceSheriff] (August 11, 2018). "Thanks to everyone for sharing accurate information, insuring the public's safety. The federal agencies will lead the investigation. All further inquiries should be directed to the Seattle FBI office" (Tweet) – via Twitter. ^ a b Kogan, Danielle (August 11, 2018). "ALASKA AIRLINES: EVERYTHING WE KNOW ABOUT THE SUICIDAL HIJACKER". Newsweek. Retrieved August 11, 2018. ^ "Airplane taken from Seattle-Tacoma International Airport has crashed". Seattle Times. August 10, 2018. ^ "Authorities probe how 'suicidal' employee could steal plane from Seattle airport". Honolulu Star Advertiser. August 11, 2018. Retrieved August 11, 2018. ^ "Man who sought 'serenity' before crashing stolen plane near Seattle is identified". The Straits Times. August 11, 2018. Retrieved August 11, 2018. ^ "Human remains, black box found from plane stolen by Seattle airport employee". USA Today. August 13, 2018. Retrieved August 13, 2018. ^ a b "FBI Completes Investigation into August 2018 Unauthorized Flight from Seattle-Tacoma Airport". Seattle, Washington: Federal Bureau of Investigation. Retrieved November 9, 2018. ^ Levin, Alan (November 9, 2018). "Horizon Air Worker Who Crashed Plane Bent on Suicide, Not Terror". Bloomberg. ^ "Seattle: stolen plane crashes after rogue take-off from Sea-Tac airport". The Guardian. August 11, 2018. ^ a b c "Man who took Horizon Air plane from Sea-Tac Airport was quiet, well liked, says former co-worker". The Seattle Times. August 11, 2018. ^ Gutman, David; Bernton, Hal (August 19, 2018). "Richard Russell was a jokester who complained about work, but Sea-Tac plane heist still baffles friends". The Seattle Times. ^ Betz, Bradford (August 12, 2018). "Family of man who stole plane at Sea-Tac express 'shock,' others say 'Beebo' was friendly guy". Fox News. ^ a b Langone, Alix (August 12, 2018). "'Beebo Was Loved By Everyone.' Family Left Heartbroken After Airline Worker Steals and Crashes Plane". Time. ^ Staff writer(s) (April 2, 2012). "New bakery is a labor of love". The World. ^ "Authorities don't believe man who stole plane had a pilot's license". CBS. Retrieved August 11, 2018. ^ Kamb, Lewis (September 12, 2018). "'Airplane of opportunity'? Richard Russell raised pilot's suspicions a year before Sea-Tac plane heist". The Seattle Times. ^ D'Angelo, Bob (August 12, 2018). "Who was Richard Russell? 7 things to know". AJC. Retrieved August 12, 2018.